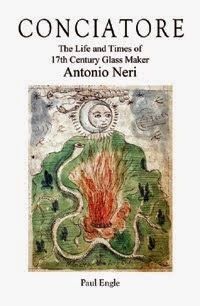 There are two known likenesses of Glassmaker Antonio Neri. The first is a portrait in ink and watercolor, drawn in 1598 by the twenty-two year old Neri's own hand. It resides in the University of Glasgow special collections department, in what is his earliest known manuscript, an alchemical treatise entitled Treasure of the World. Given his birth in 1576, this writing must have been started a very short time after Neri's ordination as a Roman Catholic priest. This manuscript contains a number of illustrations showing both men and women performing chemical work with various apparatus and furnaces, but only this one drawing depicts the author himself. He appears leaning over a glass flask in which he is collecting saliva (for a recipe to make "sale detto sputo dell uomo" or "salt called 'spit of man'"). In part, the text reads "Of me, priest Antonio Neri Florentine 1598." 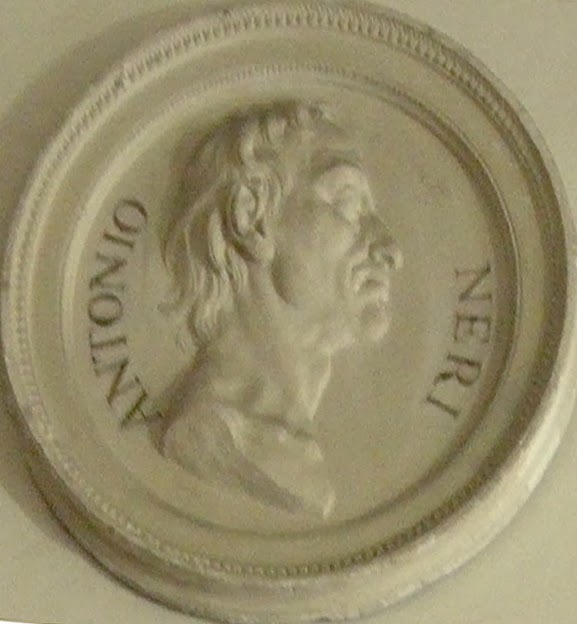 The second image of Antonio Neri takes the form of a large round plaster medallion, in bas-relief. It was probably prepared for an 1841 meeting of the "Scienziati Italiani" The Italian Congress of Science. Invitations were sent around the world and in August, guests and participants converged on Florence. After opening ceremonies in the Hall of the Five Hundred of the Palazzo Vecchio, sessions took place in the Museum of Natural History, situated next to the Pitti Palace. The museum, still open today, was the first cabinet of curiosities open to the public and dedicated to education. Peter Leopold in 1771, the museum was intended to store and display the collected scientific instruments, books and artifacts of the Medici dynasty. It was also to be a working research laboratory, in which the grand duke himself maintained a space. It was opened to the public in 1775 and sixty-five years later the facility underwent an overhaul, in preparation for the congress of scientists. The construction included a new hall, the Galileo Trubuna, dedicated to the remembrance of great Italian scientists, with astronomer Galileo Galilei taking the place of greatest honor. The space included a number of large marble medallions showing busts of prominent scientists in bas-relief, carved by a variety of well known sculptors of the time. The artists were Cambi, Nencini, Pozzi, Gostoli, Santerelli, Demi, Fantacchiotti, Romanelli, Pampaloni, Magi and Lusini. In addition to the marble medallions, there are a number of others scattered through the museum, executed in identical style, but in gesso. One from this second grouping shows the portrait of Antonio Neri. The artist is not known, although it is reasonable to conclude that the gesso pieces were executed by some of the same artists that carved the marble likenesses for the Tribuna. Another possibility, just as likely is that the gesso medallions were prepared later, perhaps for museum director Hugo Schiff who, in the early 1880s founded the Chemical Institute of the University of Florence, which included a large lecture hall "adorned with medallions and busts of the most famous chemists." The Neri medallion presents something of a mystery in that it was executed over two centuries after his death, but the model for this likeness is unidentified. His image, in some form or other, must have been available from which the sculptor could work. To date, no such likeness other than the above has been found; the possibility of another image holds out hope for as yet undiscovered source material from the glassmaker's lifetime.